Oh, sorry…I started dreaming of cookies and donuts and brownies and cheesecake…ahem…let me pull myself together here. Sugar. Yep, sugar. It’s the stuff dreams and food addictions and great date nights and insulin pumps are made of. Here in America, we have a love-hate relationship with it. It’s blamed for behavior problems, the rise in diabetes, disease, tooth decay and lowered immune systems. This villainization of sugar has led to various sugar substitutes to hit the market. Somehow, people have started thinking that these chemicals are somehow ‘healthier’ than regular old natural sugar. You can read more about that HERE. This article is about sugar. Everything in the world you want to know about some of the various sweeteners out there, so you can make an informed decision on what to use and when to use it. Fructose is fruit sugar. When your body breaks it down, it uses as much as it can for energy, then stores the rest as fat. This is especially true for fructose from sucrose. Fructose from whole fruits contain fiber and nutrients that help the body metabolize it more efficiently. What this means is that, the less processed the sugar, and the more natural it’s source, the more of the sugar the body uses, and the less goes to be stored as fat. This is important when comparing a highly processed sugar, like corn syrup, and a natural sugar, like fruit or honey. Glucose is sugar in the blood. Carbs and certain types of sugar are broken down in the body and become glucose. Yes, this is what they test for when you drink that nasty drink during your pregnancy to see if you have gestational diabetes. Sucrose is a combination sugar, half fructose and half glucose. Lactose is milk sugar…YES! milk has sugar in it…not added to it, it’s part of it. Glycemic Index (GI): this is a number given to a food that basically tells you how much it spikes your blood sugar after eating it. It is important for diabetics, but also affects those of us without diabetes. A spike in blood sugar will leave you hungry later and may cause mood swings or hyperactivity in kids and adults. Now that you have memorized the various types of sugar, you understand that sugar with more glucose with spike your blood sugar more than sugar with more fructose. However, sugar with more fructose stores unused sugar as fat. Now that you know this, as well as the various info about processing and vitamins, minerals, and antioxidants in some sugars, you should know enough to give a lecture on it to any girl scout troop. 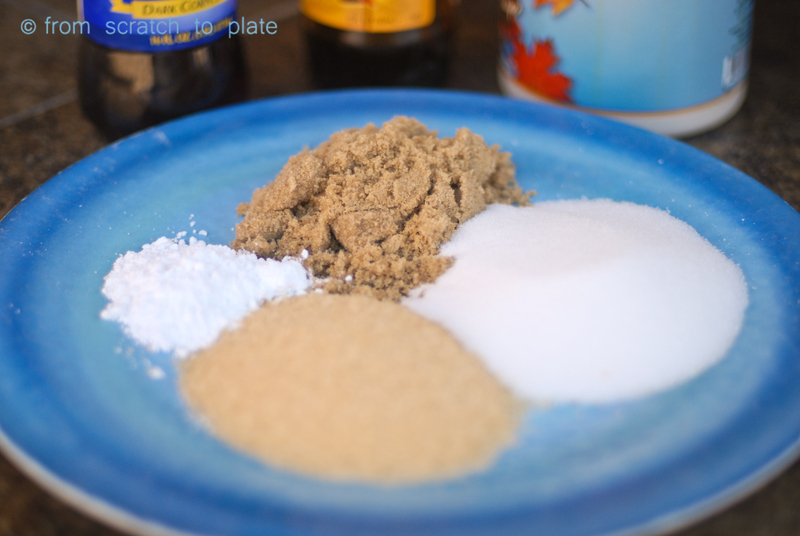 Oh, and pick which sugar you think is right for various needs in your cooking and baking for your particular family.